I began pondering the concept of ethics as it relates to politics this last week and immediately the old adage “power corrupts” came to my mind. A short Google search revealed that the phrase is attributed to one Lord Acton whose entire quote went something like this: “Power tends to corrupt, and absolute power corrupts absolutely. Great men are almost always bad men.” As I further pondered this, I too considered the condition of man’s soul. Is man basically evil? I first considered this very question in Ms. Brown’s literature class when we were reading Golding’s Lord of the Flies. The question that I had to answer from Ms. Brown was this, “Is Nelson Spear experienced (i.e., old) enough to answer that question.” She let me come to the conclusion that I was not old enough to answer that question. That was 30 years ago. Since that time, I have had adequate opportunity to learn of man’s ability to be good and of man’s ability to be evil. My studies in college and law school revealed many atrocities of evil were committed by people thinking that they were doing the ethical thing! As a prosecutor, I mostly saw the worst of human nature. The crimes committed against children by adults made me doubt at times that God cared for these dear little ones. As a businessman, I see respected men and women fudge on things to make a profit. I have also seen outright stealing by respected businessman that would have imprisoned a blue collar worker, but landed the businessman only a civil action. My time walking and studying as a Christian confirmed my belief that man is basically evil (See Romans 3:23). Christianity certainly has proved that last point to be correct in that Christianity has a serious credibility issue for the things that people have done and continue to do for the sake of Christianity. However, I still believed in the ability of man to allow God to interrupt his life and be redeemed. I have seen this many times as a Christian, prosecutor and businessman. Society’s worst of the worst are now totally transformed and every one of them has attributed their change to their belief in God’s only Son, Jesus Christ. Some of the most effective evangelists that I have personally met were those evangelists who were ministering to those who are in living in a lifestyle the evangelist had once lived themselves. These evangelists speak of how God (through their fellow man) changed their hearts. Indeed, all persons that I have met that consider themselves born again can point to a testimony or a witness of another person that turned them from the road of the selfish old man to the road of the selfless new man. The conclusions that I have reached about man’s character include: 1). Man is flawed and will do things that are self-serving to the detriment of himself and his fellow man; 2). Man is capable of being turned away from the detrimental things and being turned to the things that are to the benefit of mankind; and, 3). That the turning of man from selfish to selfless actions happens by God’s intervention through the use of our fellow man. This begs the question: If man is basically flawed, can there be any governmental system that can withstand man’s sin nature. The short answer is “Yes!” In answering this question, I present a correlation between governmental ethics and personal ethics. It may be a reflection on human nature, that such devices should be necessary to control the abuses of government. But what is government itself, but the greatest of all reflections on human nature? If men were angels, no government would be necessary. If angels were to govern men, neither external nor internal controls on government would be necessary. In framing a government which is to be administered by men over men, the great difficulty lies in this: you must first enable the government to control the governed; and in the next place oblige it to control itself. A dependence on the people is, no doubt, the primary control on the government; but experience has taught mankind the necessity of auxiliary precautions. The phrase “checks and balances” immediately comes to my mind when reading The Federalist No. 51. Under this concept, the federal government is obliged to control itself by requiring each branch of the government to be held accountable to a fix standard of ideals. Each branch would be consistently tested to see if they themselves stayed within those standards. They would be held accountable to those standards by not only the people, but they were first to be held accountable to each other. Simply stated, there is a requirement of each branch of the government to stand up to another branch of government that may become overreaching in its exercise of power. As a result of this structure of government, we have come to have trust and have confidence in the United States Constitution (and the subordinate state constitutions) as the clear standard for our governmental ethics. Madison views mankind as fallible and that without checks and balances in our governmental systems, our governments will fail. Still, Madison’s solution to the governmental ethic problem included relying on the people as the “primary control on the government.” With that in mind, I would define Madison’s model of checks and balances simply as: 1). Start with a clear standard to follow; 2). Require the three entities to hold each other accountable to that standard; and, 3). Rely on the people to correct the problem if more than one entity steps outside the set standards or if one of the three entities refuses to bend to the correction of the other two. This form of government with the checks and balances has worked pretty well for the last 223 years or so despite man’s fallibility. But things seem to be getting worse. In some places in New Mexico’s government, it seems that the three branches of government are not holding themselves accountable to each other. Just now the public is raising its voice loud enough that some things are beginning to happen. Even with the ethical rules in place, New Mexico’s politicians have had a long history (and reputation) of ethical lapses. New Mexico is not alone, however, in these ethical missteps. Congress has many ethical rules in place, yet the Congress itself has had Democrats and Republicans wrapped up in scandals so large that it boggles the mind. Moreover, their own leadership has historically refused to discipline the offending member until public pressure forced the respective leadership in to disciplining that offending member. As a result of these personal ethical lapses in a governmental setting, public confidence in that government has become compromised. 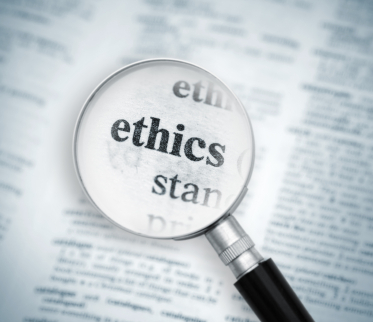 Should personal ethics be defined differently for each person? Some people think that personal ethics should be defined on a subjective basis rather than on an objective basis. This reasoning results in a standard no one could rely upon in their day-to-day business or personal affairs. Even with a set of governmental rules imposed on a public servant, personal ethics do not come into play unless that public servant has “adopted” those rules as all or part of their own ethics. For example, an unethical person with the Department of Motor Vehicles may sell a driver’s license to a person who is not entitled to a driver’s license for $500 based upon the justification that the seller has a personal “emergency.” Additionally, the person selling the driver’s license may see it as a “one time deal.” There are already rules in place that prohibit that kind of conduct, but it does not stop it. In this example, the unethical person always considers the option of doing the unethical act; the ethical person would never have considered improperly selling the driver’s license regardless of any justification. Following an objective standard for our personal ethics is thus necessary for the successful (and peaceful) continuation of society in general. This example also demonstrates that governmentally imposed ethics rules do not make much of a difference to the unethical person. Outside rules only operate to remind the ethical person what behavior is permissible and what behavior is not permissible. If a person of lesser character is in a position to gain something by being unethical, they will be unethical for that moment and define their act by justification. As demonstrated in the example, a varying standard of checks and balances will not work. Without our own checks and balances, not only we will fail in our personal relationships, but we will also fail in our other relationships. Consider Madison’s own writings in support of passage of the United States Constitution – the standard for government ethics. While Federalist No. 51 may not be a direct call for personal ethics, the implication is clear to me: In order for the proposed system of government to work, all citizens must operate on a set standard of personal ethics within the governmental system. Thus, personal ethics is an essential part of the checks and balances of our form of government. If my conclusion about having an objective standard for personal ethics is correct, then we should consider using Madison’s model of checks and balances for our personal ethics with one clear standard... that standard being the Bible. I realize the implications of this suggestion. It may contradict a letter written by Thomas Jefferson that suggests there should separation of church and state. I do not make this suggestion without some thought. The outside ethical reforms that have been instituted have not been successful. Something different has to be tried. I realize the above is a tough standard. But we are more than mere animals. We have the ability to reason and we have the ability to be reasonable. That is what makes us civilized. The more cynical side of me tells me that Madison’s model would not work with politicians because their egos would not allow them to be corrected by a political party or party leadership, let alone their closest friends and loved ones. However, I am personally acquainted with several politicians in New Mexico that I know have accepted this ideal. My wife and I have the reference to this verse inscribed on our wedding rings. We did so because we realize that our roles as friends, husband and wife, father and mother, and business associates would be much smoother and stress free with the Lord as our life partner. I understand that not everyone sees things the way I do. Some have a real problem of “giving it all over to God” and being subject to being held accountable to anyone but themselves. Let me ask this question then: Is it possible or appropriate to separate being a Christian from following Christian ideals? Some revisionists who call themselves historians seem to have made the strong faiths of our founding fathers less relevant to history. If their faiths were indeed less relevant than earlier historians portrayed, perhaps then they were not all men of faith but still respected the values that the Christian Bible stood for and thus incorporated them into the new government. Other cultures have also recognized the logic of the three-member team. The little that I have read about Vietnam and the communist enemy fight groups tells me that the enemy did not usually want to send out their groups in groups of less than three people. The reason being is that one may yell, “Chu Hoi.” Two may even yell, “Chu Hoi.” The enemy realized that strategically three are much less likely to give up in a fire fight rather than if there were only one or two in the same fight. The power of three is also seen in other circumstances. The people who worship nature see the heaven, the earth and the waters. The mathematicians see triune ideas everywhere ... remember Pythagorean’s Theorem? A more careful examination of the original “power corrupts” quote reveals that the word “tends” is snuck in there. I suggest a more accurate quote would say something like, “Power reveals character in the human soul.” “Absolute power reveals character absolutely.” A person whose actions are not in check with a higher power first, their equally yoked friends second and to their community third will unquestionably fail ethically, morally, and eventually legally. The DMV worker without a clear standard of personal ethics would be the same person if he were elected to Congress; the DMV worker would just have more power. Personal ethics reform can only be accomplished internally. It begins with a humble spirit that is both teachable and correctable. It includes the individual making themselves personally accountable to at least two people. It also includes accountability for their actions in public and private matters - you cannot separate the two. Only when we have “accountable” politicians in office will we see true ethics reform. More outside rules and laws are not the answer. More ethically accountable people who are willing to serve is the answer.